Three weeks ago I shared an update about how my world fell apart on my Jersey to France (and back again) swim. I'd like to start by thanking every single person that send public or private messages after that write up and swim. I had all sorts of great advice and spent some time reflecting before deciding what next. This write up will take you on my journey from that day. Not finishing a swim is never easy and this one was particularly difficult given that it was about stress and fear. I've had some time to reflect and to chat things through. You may be surprised to learn that I have zero regrets from getting out of the water on that day. The mind and body are intrinsically linked. Was it the mind or was the body - which led the other? Does it matter? I suspect that my stress levels from life were just so high at that time that my body told my head to stop for my own health. My head needed a plausible reason and there were plenty of previous negative experiences to call on for help. So I look at it this way, I stopped because on that day it was the right thing to do for my own physical health. The challenge then became do I do the English Channel solo that I already had booked or do I step away from it all. That was a tough decision and one I couldn't even consider for over a week. I had zero interest in getting in the water for the remainder of my time in Jersey. Back in Dover on the weekend and I still didn't want to get in the water. Luckily, I had a couple of people would value my support in the water which meant I did get back in for the shortest of dips. And so the healing began. It was that week that I read the article about the England football team psychologist and that seemed to have an emphasis on excitement rather than fear. That sank in. When I thought about an EC solo, I felt what seemed to be excitement but hardly dared to admit that even to myself as excitement and fear can actually feel fairly similar with the butterfly tummy sort of effect. When I put it that way, the answer was obvious. To not even start would leave so many what ifs? Swimming may not be successful but also it may. Not starting felt like failure in its own right. The only decision then was to go under the radar or publicly. My gut this time said to go publicly but subtly. This is where the picture below came in. 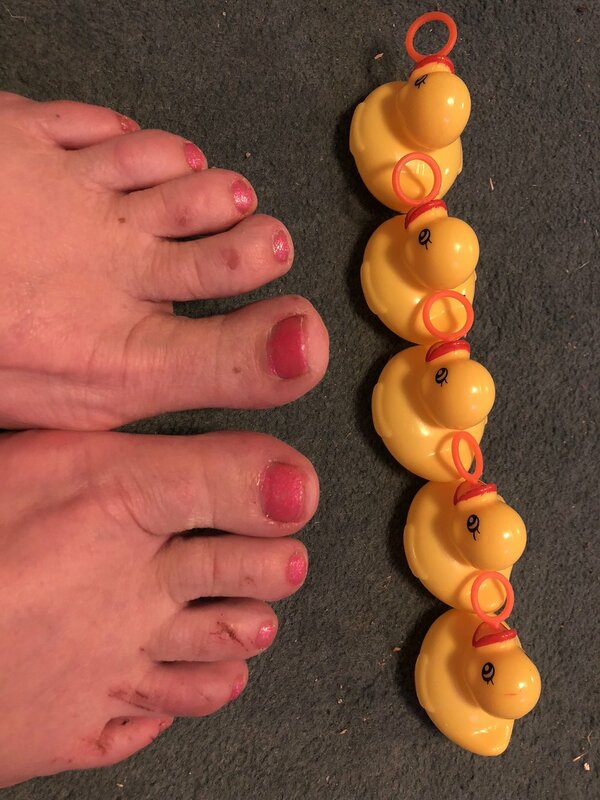 It showed that I had my ducks in a row and anyone who knows me will also know that I wear event nail varnish on my toes. This one was called 'get your pink on' which seemed appropriate for swimming next to a pink boat. Then of course there were the words of wisdom from Freda - do it and do it soon. I value Freda's advice and always have. My tide started on Friday 20th July. I told Neil that I had my eye on the Monday. At that time the wind forecast was favourable, it was forecast to be sunny & hot and the tide was at its lowest. That forecast become what seemed like a random number generator. Neil texted that he thought Sunday looked good. The next update it seemed that Saturday looked good. The Saturday forecast seemed to stick and I put the wheels in motion to get cover for the beach. An added complication was that I had been approached many months ago by musician Matthew Herbert who takes sounds from everyday items to produce electronic music. He's latest plan was to create a Brexit themed piece and in support of this he wanted to record the sound of a channel swim. I agreed to support this so it meant that it was no longer just me and my crew to co-ordinate, but the sound recordist and camera operator also. Somehow this also came together. The night before I had a vivid dream where it was clear that I completed the swim. Dare I take this as a good sign? Friday 20th July was probably the worst date to travel down to Dover as it marked the start of the school holidays and the usual mass exodus out of the country. The traffic was truly horrendous. The normal 1hr 30min journey took 3hr 45 mins. I'd had some chiropractic treatment that day on my back, I needn't have bothered. By the end of that journey I was in all sorts of pain and discomfort. It was to be an early start - meet the camera and recording people at 0415 and Neil at 0430 so a quick something to eat in the hotel and off to bed. The alarm went off at a very antisocial hour. There wasn't much to be done - fill the pump flask with boiling water, make some ready porridge for breakfast, put copious quantities of sunblock on in the dark (that never ceases to amuse me) and put my swimsuit on under my clothing for the day. On top of that was my kit bag with warm layers and some bottled water - SIMPLES! It really didn't take too much effort to load this onto the boat. To my surprise, the sound recordist and camera operator were also fairly restrained with the amount they brought along. In no time at all I was saying good morning to Neil & Toby and providing the necessary details to Bel, the appointed observer for the day. Much to my surprise, they didn't trigger any anxiety on this day. Often, even on a calm day, as you turn the corner from the harbour, there can be a bit of a bump for a while. Not today, it was glassy smooth. Dare I say it, but that feeling that I couldn't quite believe could be excitement rather than nerves was there again. I asked Neil where we'd be starting from, 'Samphire Hoe' was his reply. OK, so that meant a slightly longer journey and no immediate need to get myself sorted. I told Neil that my neck ached (it did, probably from the long car journey down). 'No it doesn't!' was his reply. It really does I told him. The same 'No it doesn't!' came back. We went back and forth with this for a while and he then roped in Toby to say the same as him and pointed out that I must be wrong as I was out-numbered! Today I decide to do a dive start. Unlike normal, there's normally a bit of reluctance to take the leap as I know that's it until it's over one way or the other. That wasn't there today. Of course my goggles come off, but that's ok, I want to dunk them and apply them anyway, so that just makes it a little bit easier. It's just a few strokes to the beach. I'm proud of the fact that I manage to walk out on the pebbles (a near impossible feat), turn around and raise my arms. The horn sounds and I'm on my way. It's now or never. Within the first 10 minutes I get stung on the nose by a jellyfish - ouch!! There are literally hundreds of jellies around. I get a few stings but most keep out of my way. That feeling of excitement was still there - it really was excitement which was both unexpected and lovely. This song goes round and round for a couple of hours and then fades as I zone out in the swim. Other songs come in from time to time and when I want it, I call this one back again. I swam for 2 hours before anything, then hourly on water, sugar free squash or black tea. I had one feed of zero calorie electrolyte. That was until 13 hours. I can't remember exactly when, but I had some paracetamol for a sore groin (dodgy left kick!). A little later I had some naproxen for a sore wrist. This is something I didn't want to take on an empty stomach so I had a jaffa cake. So, up to 13 hours I had 45 calories. At 13 hours the team decided that I needed a boost as my speed had slowed, so I was given a UCAN feed. At 14 hours I was given a CNP mega feed and then again at 14:45 hours. I didn't have another feed after that. Question is, why did I slow down? Could it be lack of calories? I genuinely don't think so. Could it be dehydration? I don't think so, this time I managed to drink pretty much all I was given and was able to pee throughout. Electrolytes? Lack of training? Some other cause? I'll never know. For those of you who are interested in the science behind feeding, I added the calories up and I had about 785 calories in total (plus the porridge I had for breakfast). I took my weight Friday morning and again Monday morning. In between I lost 3.1lbs. Let's assume that's actual weightless and not dehydration - that equates to burning a net 11,000 calories burned. All I can say, there are far easier ways to lose 3lb!! All of the negativity from my Jersey swim had gone. I felt relaxed and safe. I swam for 2 hours as is my norm. I like to put a reasonable distance between me and England before I stop for the first time. The conditions were perfect, absolutely perfect. It was sunny and calm. I generally assess my progress by watching ships. My aim is to reach the first shipping lane by 4 hours. I didn't see a ship until just after the 4 hour feed, it was a little way behind so I figured I must have been in the lane by 4 hours. It turns out that I was in the lane by 3hrs 10mins - the fastest of all my swims. There really weren't many ships that day so I couldn't work out when I went into the NE lane. It turns out it was at 7 hours - consistent with previous swims. I know that now, I didn't know that then. The best I could do at that time was to say 'trust the process', by which I meant swim from feed to feed and slowly reel it in. I did consider asking where I was, but I figured I either wouldn't receive an answer or it would be one that couldn't be relied on. Whilst the air and water were warm, I think I thought myself cold at points. Serious cold patches probably didn't help (though I loved the warm patches). My jaw was quite tense and I seemed to bite my tongue throughout. I tend to only do that when I'm cold. I kept swimming, watching the antics of Paul, Neil, Toby and Bel. There was Dad dancing and things being thrown at me. What really made me chuckle was Neil telling me to have a word with Bel at one point, apparently she had made 4 cups of tea with a single tea bag! Apparently I went quite close to ZC2 again and they were concerned that I'd see it and it would trigger memories from last year. They needn't have worried as I didn't see it. In fact we went passed it twice - once in each direction of the tide and once behind it and once in front of it. As the light started to fade I started to feel a little chilly. I associated it with the disappearing sun. It seems it was more likely to be related to the slight chilly breeze that started. In fact I noticed that when that stopped I felt a lot warmer. Perhaps it's not the dark that caused my cold feeling last year after all! However, the association was there and I asked 'is this going to be a repeat of last year?' 'No!' came the answer - well they would say that. Then I noticed the cap out of the corner of my eye and it looked close! Whilst I knew we wouldn't land there, it became possible again. I heard them tell me one more feed after this one. Really? That could be up to 2 hours! I hadn't heard the whole statement. What was actually said was it could be another feed if I don't push on. Neil then said it was 1 mile to go - that I could get my head around so I swam on. I definitely didn't want to get out, I was having a wobble about failing. After the event I found out it was actually 1.4 miles - a convenient rounding down! I pushed on as hard as I could, suddenly motivated again. A couple of other swims finished and came to say hello on their way home - that's always a lovely treat. I noticed the navigation lights and floodlights getting switched on. Uh oh, it's starting to get dark. I'll probably need to turn my lights on soon. A flutter of fear appears. Then I notice them getting the kayak into the water and not too long after that I see Paul paddling alongside me. Eventually Suva stops and we carry on alone. I decide to swim until I literally run out of water. Eventually my fingers touch sand and it's time to stand in less than knee deep water. I'm a little uncoordinated! On the beach are some locals with the lights from their phones shining towards me, applauding me as I finish the swim. I clear the water, carefully keeping away from anyone until I'm completely clear. Then it's time to shake hands and have a quick chat. The icing on the cake for me was being given a pebble from a French man. He won't have known that I have always failed to get a pebble and I desperately wanted one. To have one given to me by a local is the perfect way to close that episode. I gave Paul a hug on the beach - he later commented that I was warm. I then let him tow me back to Suva - my wrist really was quite sore. Neil held his hand out to help me back on board and commented that I was warm. Very interesting - so whilst I felt cold, that was actually in my head this time. I suspect it was the CNP mega boost that had me dashing to the back of the boat just as we got back to Dover. It was probably also the cause of serious digestive issues for the next few days! It did the trick though. Before this swim, I had made the decision that not only did I need a break from the relentless need to train, but also wanted to support a friend in their training, so intend to take at least 2 seasons off. All that said, I think that channel swims are like both child birth and children. By that I mean, you forget the agony of childbirth very quickly and the same is true of a channel swim. It only takes a matter of days (like now) when you have the rose tinted memories. They're like children when you do multiple swims in that you assume the second swim will be like the first (and it isn't). Then you assume that the third will be like the first or the second or maybe a blend of the two. It's not!! So, I have now started 7 English Channel Solos and finished 3. I believe that I'm something like the 77th person to complete 3 or more swims. What drives me (or the 76 others) to go through this more than once? Now that is a good question. I don't think I have an answer for that, but I now have at least 2 years to ponder.